Gymnocephalus cernuus Linnaeus, 1758, European lakes. No subspecies are recognized. English: Pope; French: Frash, grйmille; German: Kaulbarsch, Pfaffenlaus; Spanish: Acerina. Maximum total length 9.8 in (25 cm). 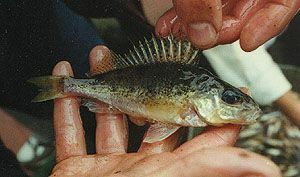 Small, dark-spotted, brownish fish with 15 to 19 long dorsal spines. Dorsal fins are fused. France to eastern Siberia. Accidentally introduced to Lakes Superior and Michigan in the United States. 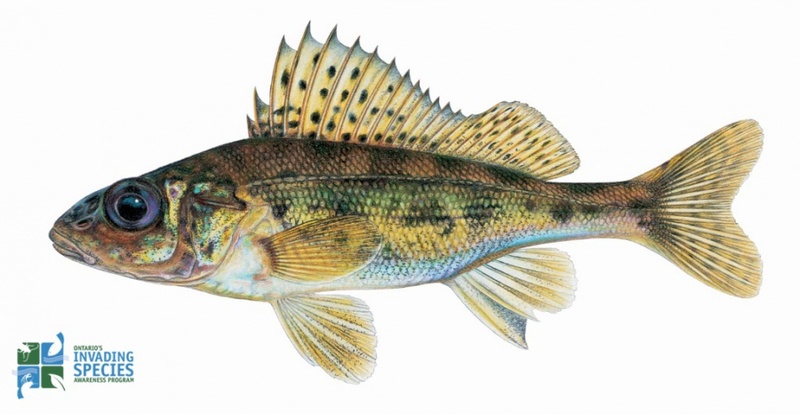 Prefers deep waters of lakes and ponds, but also found in streams. Releases alarm pheromones that alert conspecifics to danger. 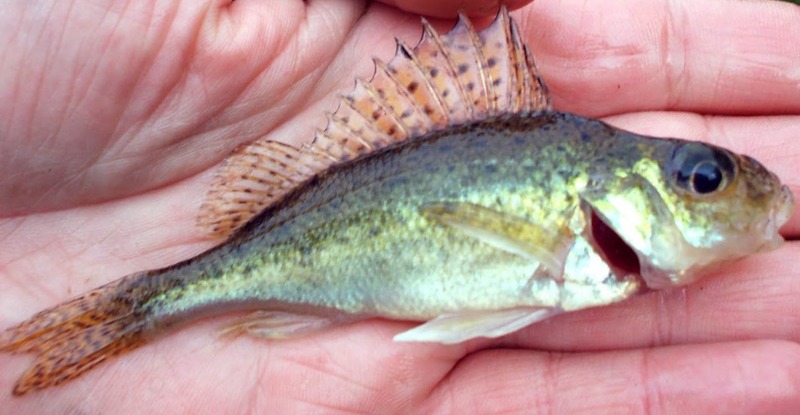 Adults have particularly well-developed neuromasts, sensory organs that can detect even slight vibrations in the water and thus allow the fishes to hunt for food in the cover of darkness. Nocturnal feeders of shallow-water zooplankton. Spawns in shallow water, where strands of sticky, whitish yellow, demersal eggs adhere to weeds and/or rocks along the bottom. No parental care for eggs or young, which hatch in 5–12 days. They attain sexual maturity in two to three years at 4.3–4.7 in (11–12 cm) in length. In warmer areas, sometimes become sexually mature in just one year. Sport and minor food fishes. Considered an undesirable, invasive species in the Great Lakes, where it likely arrived via ballast water from Eurasian ships.